Hear What Happened At Boston's Symphony Hall After JFK's Assassination : Deceptive Cadence Listen to an unforgettable response to the tragedy. Hear what happened next at Boston's Symphony Hall, just after conductor Erich Leinsdorf announced news of the assassination, and learn more about the backstage story. The log of the Boston Symphony Orchestra's performance on the afternoon of Friday, Nov. 22, 1963. One of the most moving documents to emerge from the 50th anniversary of President John F. Kennedy's assassination is a radio broadcast. It's WGBH's audio of what was supposed to be just another Friday afternoon concert given by the Boston Symphony Orchestra — which turned into an eloquent elegy for JFK. James Inverne, former European performing arts correspondent for Time magazine (and my former boss at Gramophone magazine, where he was editor and I was North America editor), has delved deep into what he rightly calls "one of the most emotional pieces of radio ever recorded" — and emerged with an extraordinary story. Although Kennedy's assassination was a national and even international tragedy, this president was a native son of Boston. He was born as the grandson of the former mayor John "Honey Fitz" Fitzgerald, and as the son of former Massachusetts legislator and local bigwig Joseph P. Kennedy Sr. So perhaps there were even more layers of disbelief and sorrow in Symphony Hall that day after the pride of the city was gunned down — and you can hear all of that in real time. In the days that followed, there were other heart-wrenching musical moments, like the New York Philharmonic's nationally televised performance of Mahler's "Resurrection" Symphony the day before music director Leonard Bernstein gave an unforgettable speech at Madison Square Garden that includes some of his most famous remarks: "This sorrow and rage will not inflame us to seek retribution; rather it will inflame our art ... This will be our reply to violence: to make music more intensely, more beautifully, more devotedly, than ever before." But what is most remarkable to me as as listener, hearing the Boston broadcast from Symphony Hall on that Friday afternoon, is the sense of how those people in that time and place — performer and audience member alike — process this shocking event collectively, in a way that is totally unimaginable to us 50 years later, as we learn each minute's news within the weirdly solitary glow of our screens. First, we hear the gasps and shushes after BSO music director Erich Leinsdorf utters the words: "The president of the United States has been the victim of an assassination." Second, a wave of groans and sighs after Leinsdorf continues, "We will play the funeral march from Beethoven's Third Symphony" — as if the crowd's shared response is that they couldn't possibly have heard the first part right, but that then the orchestra's change in repertoire confirms the awful, unimaginable truth. And then, for the next 14 minutes ... utter silence, save for the incomparably somber music. Inverne includes an incredible interview with Boston Symphony librarian William Shisler, to whom Leinsdorf had relayed a message less than 10 minutes before the start of the performance: Run to the archives, collect all the parts for the second movement of Beethoven's "Eroica" Symphony — the funeral march — and get them to the players as fast as you can. President Kennedy is dead. And as Shisler passed out the music to the musicians, who were already onstage by this point, he had the terrible task of relating the reason they were changing the program. As Shisler told Inverne, "I sincerely believe that music played its part in the tragedy for all of us. Afterwards of course everyone was glued to the television sets for days and days. But in that period of time when we were all there, listening to Beethoven in that concert hall, we all had to respond to this terrible tragedy for ourselves. And the music sort of soothed us, reached out to each and every individual, and helped us to process what had happened." 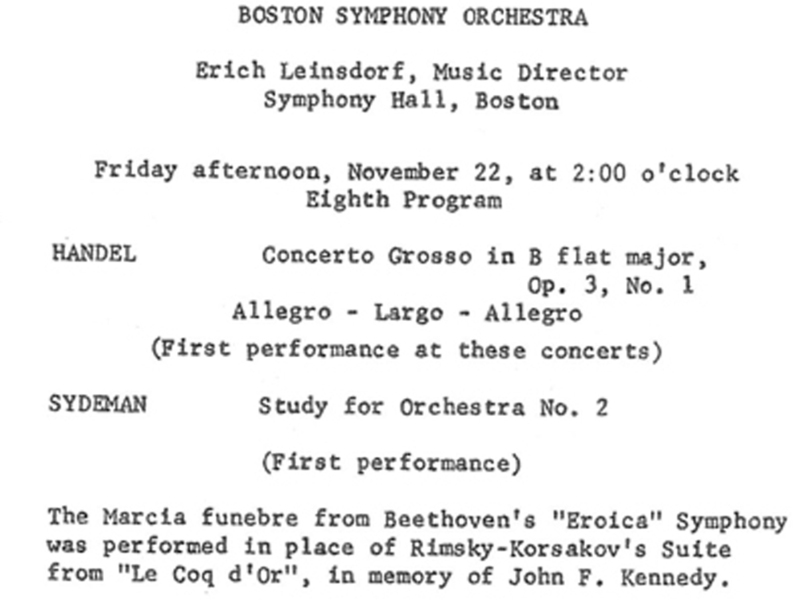 In January 1964, the BSO and area choruses performed in a memorial service at Boston's Cathedral of the Holy Cross. The New York Times reported: "Mr. Leinsdorf said earlier in the week that he had chosen Mozart's Requiem because, as was the work of President Kennedy, it was left unfinished by premature death."